When you think of a business as having a commitment to their people, you may believe this to include trivial lenience, ‘team building exercises’ or the occasional reward throughout the year for being a good sport. Exchange Utility are setting the standard for what it takes to be a fantastic employer within the Bury and Greater Manchester area. This year alone, we have acquired TWO awards that showcase commitment to our people and staff development. 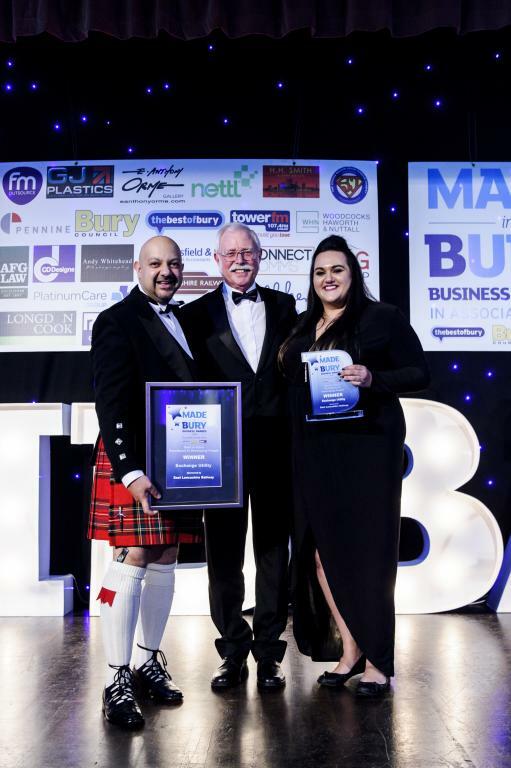 More recently, Exchange Utility entered into the Made in Bury Business Awards, where we won the Excellence in Developing People Award, sponsored by East Lancashire Railway. The Made in Bury Business Awards focus is to champion local businesses and celebrate the outstanding achievements that we have made in 2016 for both ourselves and the surrounding area. The event itself was a glamorous spectacle and all involved were elated at the opportunity to be part of such a large and reputable Bury business event. “The MIBBAs were a great event to be a part of. As a Bury-based business, it’s important for Exchange Utility to be seen as an employer that invests in recruiting local people and giving employment opportunities to the residents of Bury. To accompany this achievement, Exchange Utility also scooped up the Best Employer 2016 Trophy at the City of Manchester Business Awards in July. Meaning that we are becoming an employment force to be reckoned with. We continue to get involved with local projects, such as our recent push for Bury-based charity #fortheloveofTed. Ted Waring is a local child suffering from a brain tumour, who requires funding to help support his family and siblings during this difficult time. In support of this, Exchange Utility have experienced great success – raising £3,000 so far – by immersing their staff in a range of fun activities to produce the best possible results for the cause, drive staff engagement and generally create a better employment experience for all. A state of the art training and development facility has also been created in order to help drive the ambitions of Exchange Utility staff as we believe the commitment to this is where our success lies. The Exchange Utility culture is alive with passion, adventure, engagement and loyalty. We’re always involved in something different and really thrive on the excitement of a new challenge. The great news, if you are a job seeker, is that we announced a mass expansion within the Bury area earlier this year. The Mayor and other local businesses within Bury celebrated this as a hugely beneficial move for the health of the surrounding area and local people. 2017 is going to bring more exciting challenges forward for Exchange Utility. One thing is for sure, if you’re a job seeker looking for an enjoyable career with a difference, we could be literally right up your street.